Writer and lecturer Eran Katz holds the record for memory exercises. In his new book, he explains how simple techniques can make us all memory whizzes. 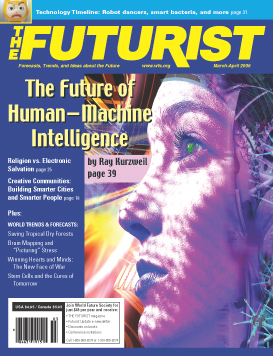 Futurist inventor Ray Kurzweil blurs the boundaries between man and machine. Futurist forecasting has long been the object of strange fascination. Specific doomsday predictions — whether derived from the Mayan calendar or calculated by Christian radio host Harold Camping — have earned widespread media coverage, prompting no small amount of ridicule and what almost seemed like disappointment the day after. Google has a one-up on my iPhone. It reads my emails before I do and knows what I am thinking by analyzing what I search for on the Internet and which Web sites I visit. It “knows” what other people think about me. George Dvorsky is a thinker looking beyond the normal bounds of human lifespan. He’s a futurist, contributing editor to the science fiction publication io9 and chair of the Institute for Ethics and Emerging Technologies — a think tank dedicated to the transformative power of technology. Google also hired futurist Ray Kurzweil as Engineering Director in 2012. From smartphone apps that can do seemingly everything to driverless cars and eerily humanlike robots, the past decade has seen dramatic advances in science and technology. What amazing advances are we likely to see in the next 10 years? Seven top futurists gave us surprising predictions.